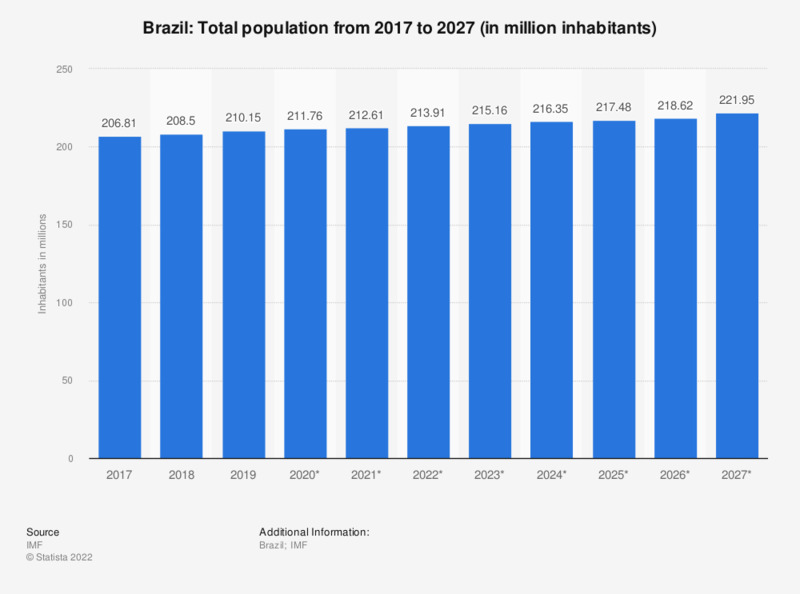 This statistic shows the total population of Brazil from 2014 to 2016, with a forecast through 2024. In 2016, the total population of Brazil amounted to 205.16 million inhabitants. Brazil has a surprisingly low (and decreasing) population growth rate; despite it being home to the largest number of Catholics in the world, the majority of women in Brazil use some form of contraception, which is often government-subsidized or free, even though the Catholic Church retains its stance that the use of contraceptives is inherently wrong. Within the space of just one generation, families have gone from having more than six children to having just one or two, and the share of Catholics in the population is dwindling, too. The influence of 'telenovelas' — the overwhelmingly popular soap operas often with strong women figures and fewer than three children — could also be helping shape the population’s view of what an ideal family is. The fertility rate in Brazil fell below the replacement rate in 2006 and is still decreasing. The impending population imbalance in Brazil can be seen in the decreasing lower tier of the country’s age distribution. This follows a trend similar to the one Japan and many European countries are experiencing, which are now facing the problems of providing for an aging population with fewer young and working taxpayers. The trend is not quite as extreme in Brazil, giving it time to prepare for the fallout of decreasing family size. This preparation will be important to help the country maintain its emerging economic strength, which is watched with interest by many economists who have said that Brazil’s is one to watch — thus its position as one of the pillars of the “big four” BRIC countries. Everything On "BRIC countries" in One Document: Edited and Divided into Handy Chapters. Including Detailed References.